Works on all versions of Windows - Even Windows 10! Now take your Credit Card Processing where others can never go. The USBSwiper Rechargeable Portable Thermal Printer will allow you to process credit card transactions and print receipts out in the field even when AC Power is not available. 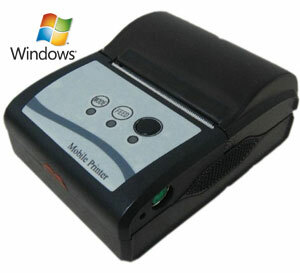 This small portable rechargeable printer will give you the security and protection you need from customer chargebacks. You should always get a customer signature on a receipt for every credit card transaction you process. Designed to work seamlessly with the USBSwiper System, you will love the portability of this small thermal printer. Weighing in at just over 1 lb and measuring only 6"L" x 3"H" x 4"W, the USBSwiper portable rechargeable thermal printer is the perfect addition to complete your system. Works on all versions of Windows even Windows 10! Picture of printer shown is for illustrative purposes only. Actual printer will meet all specifications shown above but may look slightly different. Please review the specifications of this printer to make sure it is the correct printer for your needs. Available in Black only. (When using this printer with processing systems other than USBSwiper.com, please make sure their processing software has a setting to print to 2.25" receipts. Most Virtual Terminal systems do not have this function and we do not accept returns on our printers when trying to use with those systems.). This printer does not operate cash register drawers. My transaction with USBSwiper was fast and easy for a tech-challenged guy like me. Their credit card processing system is simple and perfect for a contractor that makes deals in homeowner living rooms. Thanks for a great system! - "Roofer Mike"